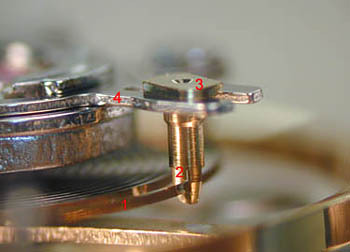 regulator ring (3) to rotate via an arm (4), adjusting the effective length of the balance spring. 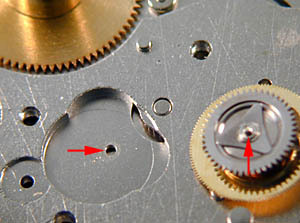 regulator can be both rotated and moved towards and away from the center of the spring with ease. It is a shame that more manufactures do not provide such adjustability. issues with this delicate part are thus eliminated. 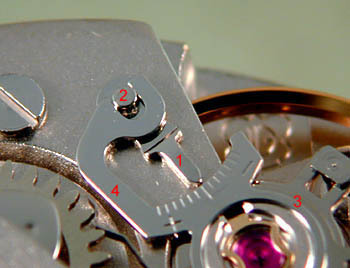 the balance wheel when the crown is pulled into the hand-setting position. 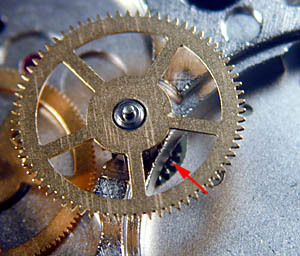 motion works (and hands) of the movement are driven indirectly through an intermediate wheel (arrow, left) attached to the extended center wheel pinion. 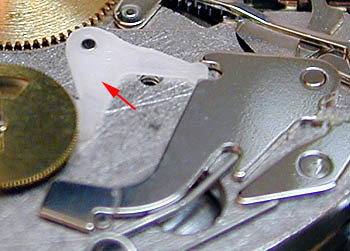 is seen in the mainspring click (left). 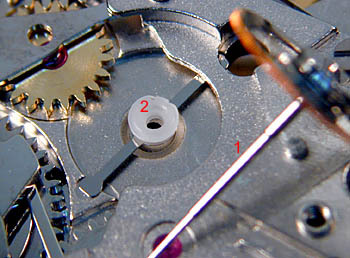 Rather than use a conventional click to prevent mainspring unwind, Valjoux has managed to use a simple bent spring anchored in a slot in the plate. 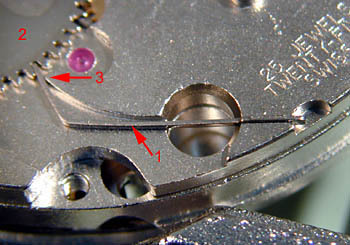 conventional calendar mechanism with date, day and date, or other complications. These are modular units that can be switched according to the caliber desired. wheel for indirect minutes drive. stamped steel levers to stop, brake, and reset the wheel. 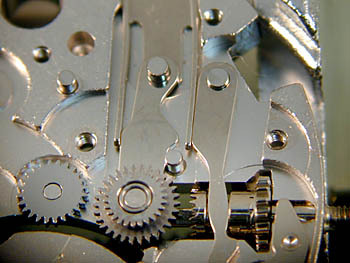 These levers are operated directly off of the lower case pusher rather than being mediated by the heart piece. 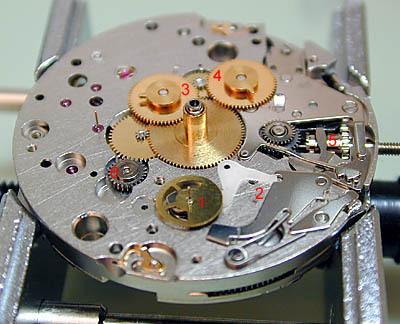 should be taken in overusing the chronograph, particularly without regular service. the keyless works components are made of stamped steel parts. 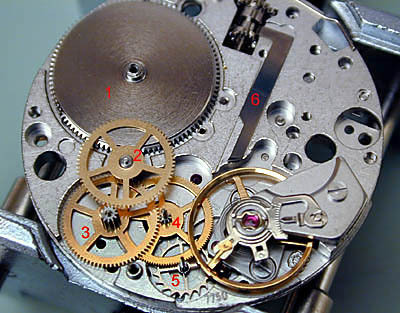 beginning of the 1940s and that provided serious, usually fatal, competition to smaller manufacturers of high-grade chronographs. 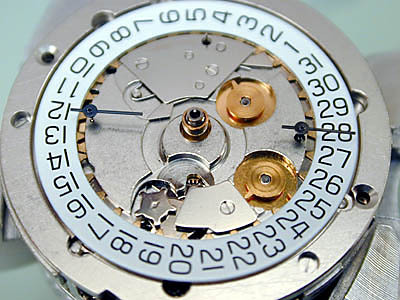 7750, mechanical chronographs might be known only to the buyers of luxury watches. I wish to thank Bob Frei of the TZ Tool Shop and Frei & Borel for supplying the movement used in this review. CONTINUE TO PART 1 OF THE ARTICLE.